Landon and his family was visiting Santa at the RiverTown Crossings mall in Michigan when the little six-year-old approached the Big Man with a very important question. After his family photo was complete, Landon ran back up to Santa. His arms were twitching in anticipation and pure adrenaline. He was going to ask something that made him very nervous. Landon was concerned that his mental condition was going to rub Santa and the elves the wrong way, but he couldn’t have been more wrong! The words seemed to really resonate with Landon. He and Santa spent another five minutes talking about Landon’s interests and the joyous Christmas season. Santa gave him undivided attention and answered all of the little one’s questions with his signature jolly demeanor. This year Santa made it onto one very special list, at least in the eyes of Naomi and her incredible son. His compassion was unmatched, and his willingness to spend a little extra time with Landon showed that he really did care about the precious little boy. Watch Landon’s story here – but be warned, you’re going to need a box of tissues by your side! 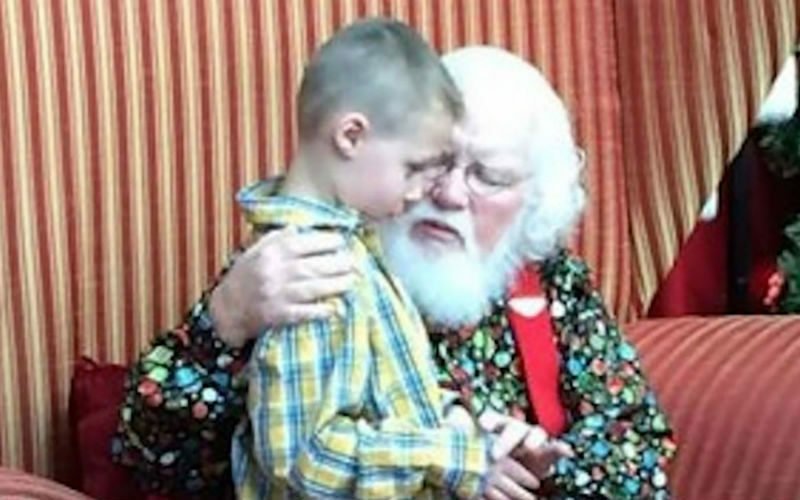 This sweet boy and his experience with Santa will definitely make you tear up. Landon will enjoy his Christmas knowing that he’s cherished by not only Santa, but Mrs. Claus, the elves and reindeer as well – all thanks to a very special white-bearded man! Just because someone thinks, looks, acts or talks differently than us does not mean that they are bad people, and Santa helped Landon understand that. This holiday season take time to give a few extra hugs to those who truly need it!